Chinese New Year is just around the corner, and here in Singapore, this annual affair is a big celebration that many look forward to. It’s the only occasion that warrants two consecutive days of public holidays, so whether you’re going to be out visiting relatives and friends, or just taking the two-day break from work to catch up on some much-needed sleep, it’s a festive period everyone enjoys. One thing everyone can agree on is the amazing Chinese New Year snacks. Pineapple tarts, bak kwa, love letters, spicy shrimp rolls — the list goes on and on. Singapore is well-known as a food haven — people even move here just for the food — so what else did you expect from our snacks? Here are some of the most essential snacks you need to try during Chinese New Year. Before we get to the good stuff, you might be wondering what Chinese New Year even is, so we’ve got you covered with this brief introduction. Chinese New Year, otherwise known as the Lunar New Year, is a festival celebrated by the Chinese. It marks the first day of the first lunar month in the Chinese calendar, and this usually happens in late January and early February. Singapore’s population is 75 per cent Chinese, so Chinese New Year is considered a major holiday here. The whole essence of this holiday is about chasing away bad luck and welcoming good fortune, and many of the traditions and customs surrounding Chinese New Year involve just that. Spring-cleaning the home before the New Year is supposed to sweep out the bad luck, and exchanging Mandarin oranges and red hongbaos are symbolic gestures of wishing others good fortune and luck. During Chinese New Year, families welcome relatives and friends into their homes and also visit the homes of extended relatives. Aside from wishing each other good luck and prosperity in the New Year, it is a time to catch up with one another — to eat, drink, and be merry. Chinese New Year snacks are a staple at these gatherings, and many people look forward to tasting and enjoying them. To help you identify these snacks, here are # of the more popular ones that are well loved by all. One of the most well-known and beloved of all Chinese New Year Snacks is pineapple tarts. These delectable morsels come in a few different forms, but traditionally they consist of a round blob of sweet pineapple jam on top of a buttery cookie. Keeping in line with the theme of prosperity, in the Hokkien dialect, pineapples are known as ‘ong lai’, which means ‘good luck is coming’. Barbecued pork jerky, more commonly known as bak kwa, is another must-have during this festive season. Long queues are often spotted at various renowned stores in the historic Chinatown as people stock up on bak kwa before and during the Chinese New Year period. The meat is pounded thin, grilled over a charcoal fire, and glazed with sauce, giving it a smoky and sweet-yet-savoury taste. Bak kwa is so popular that there are dedicated shops that specialize in nothing else but bak kwa, and there is even chicken bak kwa for Muslims and non-pork eaters to enjoy. Stories from ancient China tell the tale of how secret lovers used to write letters to each other on thin slices of biscuit wafers, which were then rolled up and sent out. The recipient would then read the message and eat the wafer to dispose of the evidence — hence the name ‘love letters’. Ingenious, right? This practice doesn’t happen these days, but these crunchy wafer rolls are still enjoyed by many during Chinese New Year. Originating from China, these cookies melt in your mouth, yet have a crunchy feel to it with the single nut on top. Almond cookies are also another food that symbolises prosperity and good fortune — the nut on the top represents good luck, and the round cookie pastry beneath it symbolizes coins or wealth. These little rolls may be small, but they pack quite a flavourful punch! Also known as hae bee hiam or mini spring rolls, they look very similar to ‘popiah’, albeit in a smaller bite-sized form. The filling within the fried wanton skin is usually spicy, so be warned before you bite into one of them. When translated directly, it means ‘New Year Cake”, and that’s exactly what it is. 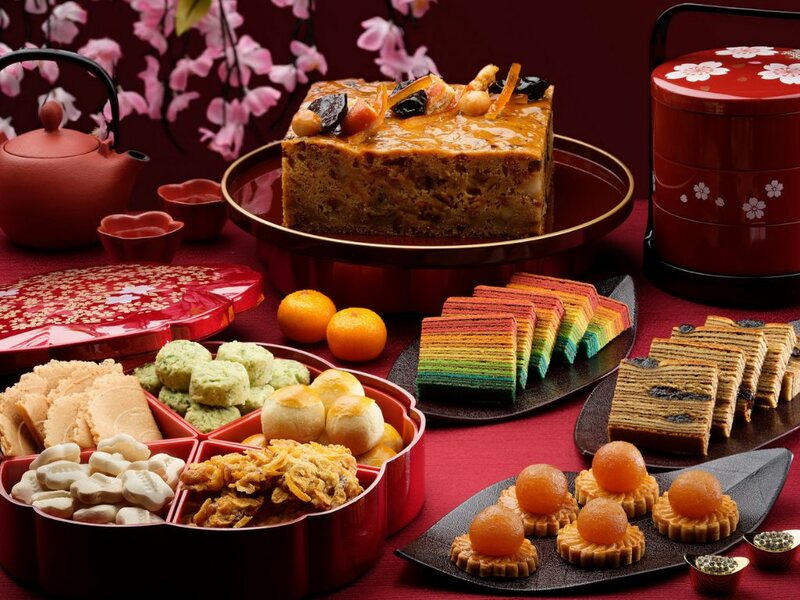 Nian gao is made of glutinous rice, and it is a popular gift during Chinese New Year in Singapore. In Mandarin, the word ‘nian’ means ‘year’ and ‘gao’ is identical to the word for ‘tall’ — as such, when you eat nian gao, it symbolizes that you will reach greater heights in the coming year.